We’re in the midst of a golden age for comic book movies, with films attracting top-tier actors and filmmakers, and even winning the occasional Academy Award (or three, in the case of Black Panther), so it’s easy to forget how far our frame of reference for a “good” comic book movie has changed. 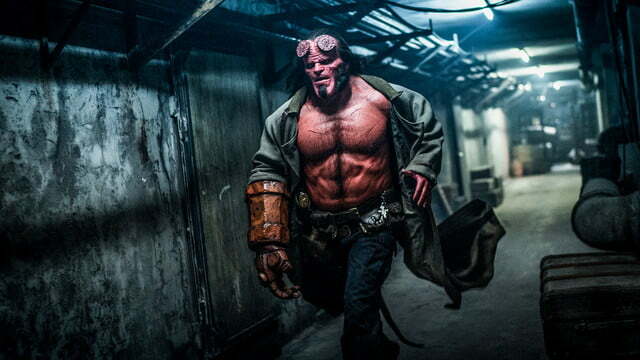 And then along comes Hellboy to remind us how mediocre a comic book movie can be. 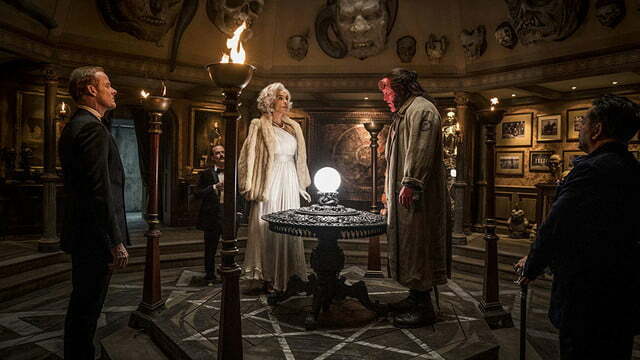 Directed by Neil Marshall (The Descent) and starring David Harbour (Stranger Things) as the film’s titular, demonic hero, Hellboy serves as a reboot of the supernatural adventure franchise originally brought to the screen in Guillermo del Toro’s 2004 film of the same name. Neither terrible nor great, Hellboy falls short of the bar set by both its predecessors — del Toro’s Hellboy and its sequel, 2008’s Hellboy II: The Golden Army — as well as the standard set by the current crop of comic book movies. 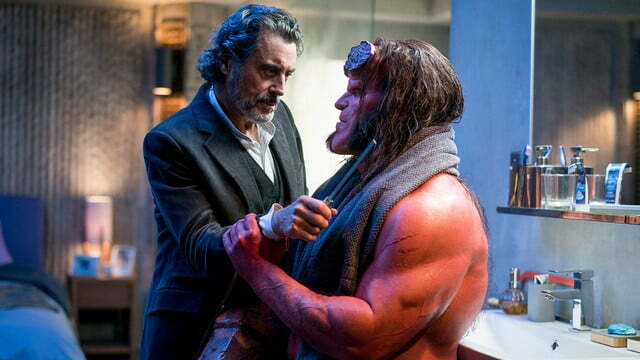 Harbour is joined in the cast by Deadwood actor Ian McShane as Professor Trevor Bruttenholm, Hellboy’s adoptive father and mentor, along with Resident Evil franchise veteran Milla Jovovich as Nimue, a powerful sorceress and the film’s primary villain. 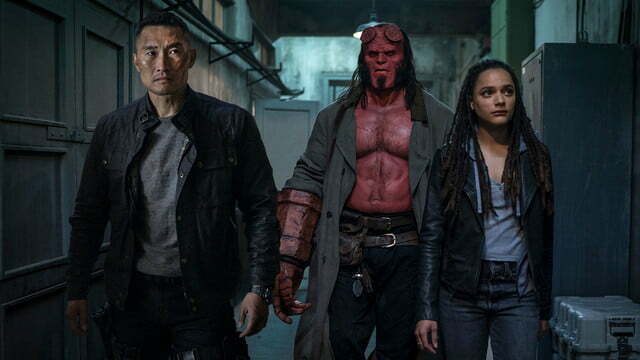 Supporting cast members include Lost actor Daniel Dae Kim as Ben Daimio, a high-ranking agent in the Bureau of Paranormal Defense who harbors some supernatural secrets of his own, and The Miseducation of Cameron Post actress Sasha Lane as Alice Monaghan, a friend of Hellboy with a connection to the spirits of the deceased. 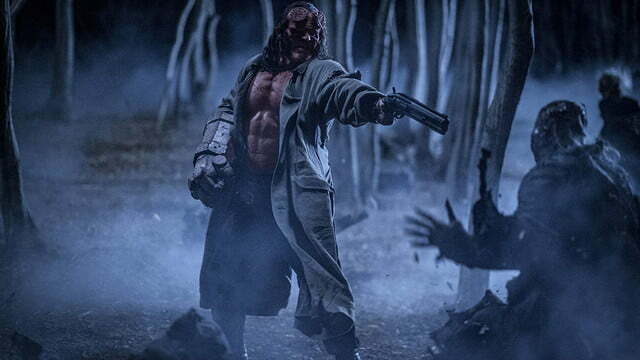 In taking on the role of Hellboy from previous franchise star Ron Perlman, Harbour does a respectable job of carrying the heavily make-upped mantle of the film’s title character, a demon struggling to find his place in the human world. 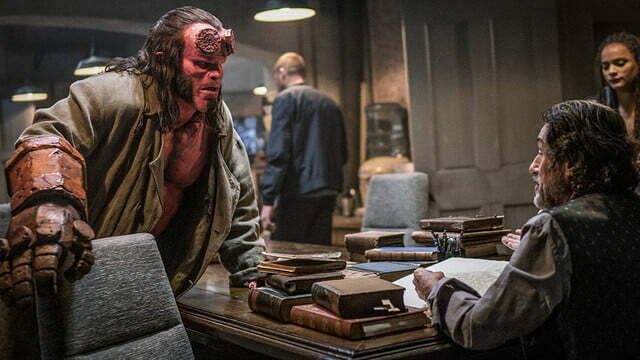 Contrasted with Perlman’s spin on the character, Harbour’s Hellboy is a more immature, tantrum-prone version of the character, saddled with self-doubt despite all of the power he wields, and grappling with a destiny he rejects. 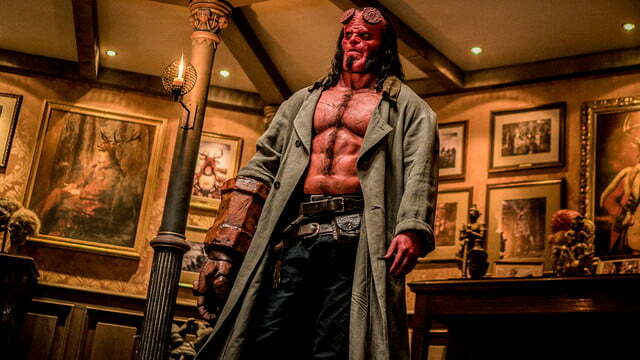 Visually, Harbour’s Hellboy is a significantly less human character than the prior, big-screen iteration, with more monstrous features that make him appear more akin to the creatures he battles than the human characters around him. Whether it’s an effect of the makeup, the script, Harbour’s performance as the character, or a combination of all these factors, that lack of humanity goes beyond the visual element of the character, and occasionally makes it difficult to connect with this version of Hellboy. Where the original franchise’s Hellboy always felt like a very human character underneath the red skin and horns, this time around Hellboy feels more monster than man, and that works against him when the story attempts to foster a sense of pathos around him. This time around Hellboy feels more monster than man. Part of the blame there might also lie in the film’s decision to seemingly abandon its supporting cast and make Hellboy a one-character story. 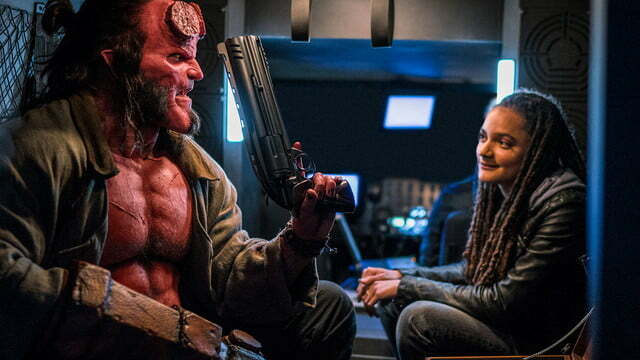 Hellboy creator Mike Mignola’s comic book series gave the titular paranormal investigator a colorful cast of both human and nonhuman characters, but Marshall’s film feels reluctant to give anyone not named Hellboy any screen time. 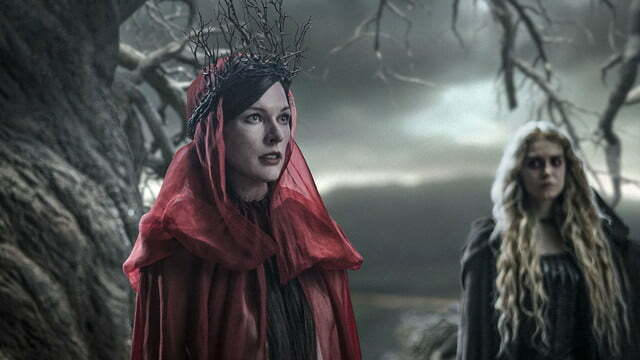 Human characters Alice Monaghan and Ben Daimio are relegated to set dressing, and never given the sort of development that aquatic empath Abe Sapien (Doug Jones) or pyrokinetic Liz Sherman (Selma Blair) were afforded in the original films, turning Hellboy into essentially a one-character show. That decision to put the sole focus on Hellboy feels intentional, as the film generally avoids the sort of character-developing moments that play to actors’ performances, and instead careens from one effects-fueled set piece to another. Fortunately, that’s not necessarily a flaw if you come into the film with appropriate expectations. Marshall previously directed one of the scariest, underappreciated horror films of the last 20 years in 2005’s The Descent, and his talent for terrifying an audience is on full display in Hellboy. Although Hellboy relies on digital effects for its creatures quite a bit more than the previous Hellboy films, the film’s R rating does get quite a workout, with some truly frightening monsters and one graphic, gory action scene after another. 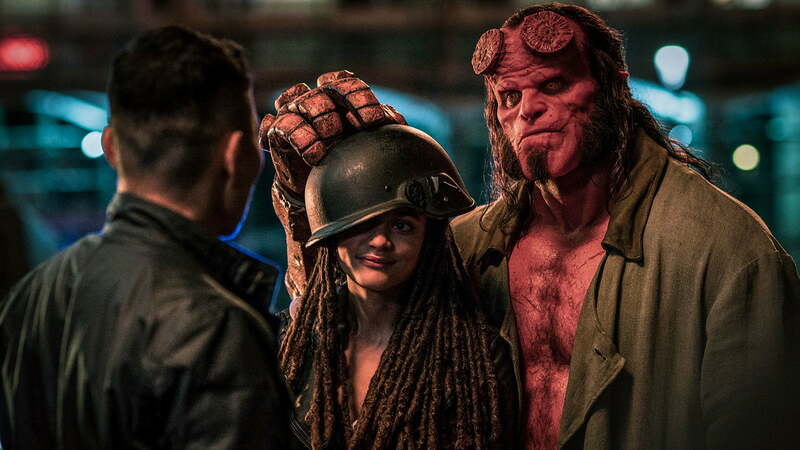 Tonally, Marshall’s Hellboy occasionally shares more in common with Hellraiser than the comics it draws its plot points from, and seems to revel in the visceral shocks that its adults-only rating allows for. Still, the absence of more substantial, practical creature effects — along with a talented creature actor on the level of original Hellboy franchise actor Jones — is keenly felt in this film, which seems content to substitute CG gore and spectacle for the texture and depth of its predecessors. 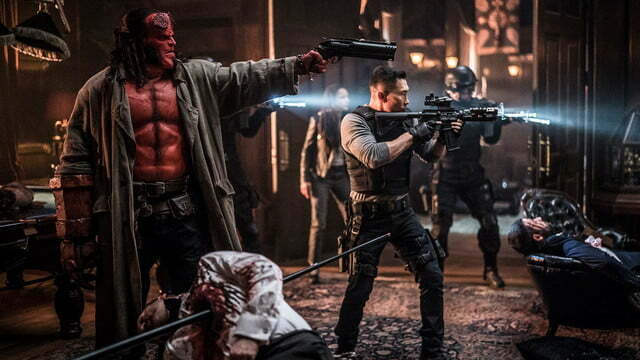 To its credit, the 2019 version of Hellboy does manage to feel like a much bigger film than the movies that preceded it. 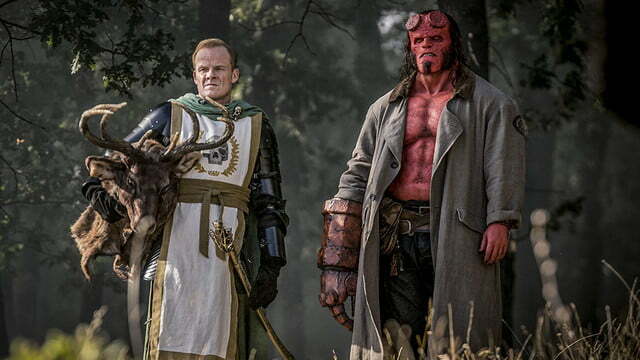 The stakes feel higher in Hellboy than they’ve felt in the character’s other big-screen adventures, and the story manages to pack a lot more into the film than you might expect. Fans of Hellboy creator Mike Mignola’s comic book series will likely appreciate all of the popular plot points and characters that make the leap from page to screen, and although they lack much depth, they don’t feel like simple fan service or — maybe more importantly — make the film feel too cluttered. That’s not to say the narrative doesn’t have a fair share of issues. 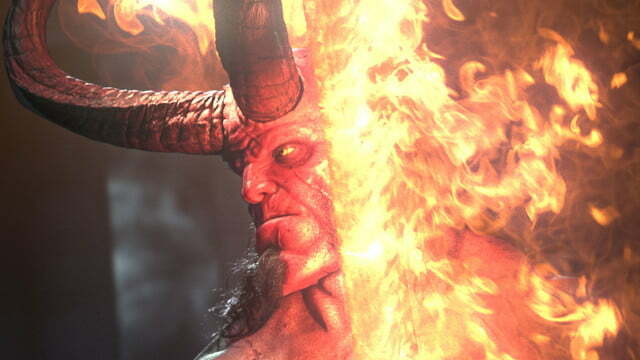 The characters in Hellboy tend to jump from one set piece to the next a little too quickly at times, and the film occasionally feels rushed despite its two-hour running time. In the interest of getting the audience to the next big creature effect, Hellboy sacrifices any meaningful development of its supporting cast, and while Harbour does the best he can to carry the film, the lack of emotional investment in his Hellboy leaves the film feeling a bit hollow. Those looking for a fantastic, gory adventure filled with creepy monsters and over-the-top action will probably be more than satisfied with what Hellboy offers. However, anyone looking for a film that elevates the character and his universe to the level of other, prominent comic book franchises dominating the big screen right now might not be as thrilled. At a time when comic book movies are expected to continually raise the bar for the genre, Hellboy seems perfectly content with being just OK — and given the giant leaps forward we’ve seen so many other franchises take in recent years, that’s more than a little disappointing.